Cravat Bandage for Temple, Cheek, or Ear.After a compress is applied to the wound, place the center of the cravat over it and hold one end over the top of the head. Carry the other end under the jaw and up the opposite side, over the top of the head, and cross the two ends at right angles over the temple on the injured side. Continue one end around over the forehead and the other around the back of the head to meet over the temple on the uninjured side. 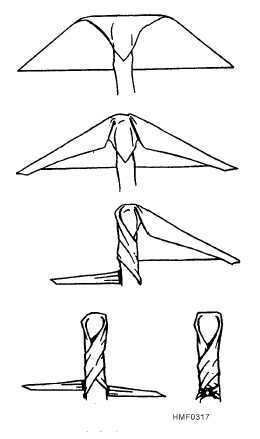 Tie the ends in a square knot. (This bandage is also called a Modified Barton.) Figure 320 shows the proper application of a cravat bandage for the temple, cheek, or ear. Cravat Bandage for Elbow or Knee.After applying the compress, and if the injury or pain is not too severe, bend the elbow or knee to a right-angle position before applying the bandage. 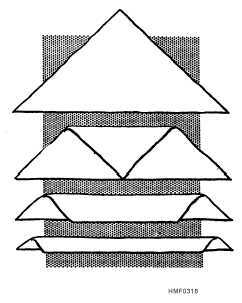 Place the 3-10 Figure 316.Triangular bandage for the side of the chest. Figure 317.Triangular bandage for the foot or hand. Figure 318.Cravat bandage.